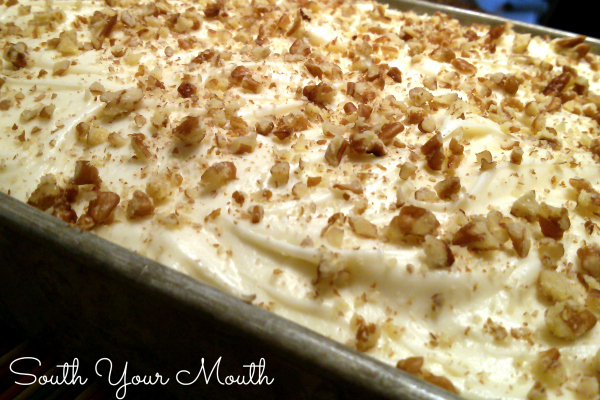 Tender moist cake recipe with crushed pineapple, pecans and coconut with a cream cheese frosting. An old Southern tradition to make this cake when the preacher comes by for a visit. I saw a recipe for this cake last week and the name really rang a bell for me. I knew exactly what it was and remembered eating it growing up once or twice. I thought about it so much that by the time the weekend rolled around I knew I had to make one! I just knew I had a recipe for it somewhere so when I went looking and couldn't find one I was stumped. I looked through all my recipes and binders and notes and still could not find one. Then I even pulled out all my old school community and church cookbooks and looked through all of them. Nothing. I knew enough about the cake to know it had crushed pineapple and nuts in it (and maybe coconut?) and that sounded an awful lot like a Hummingbird Cake (sans the bananas) so I just switched up a few things in my recipe for Hummingbird Cake and went with that! 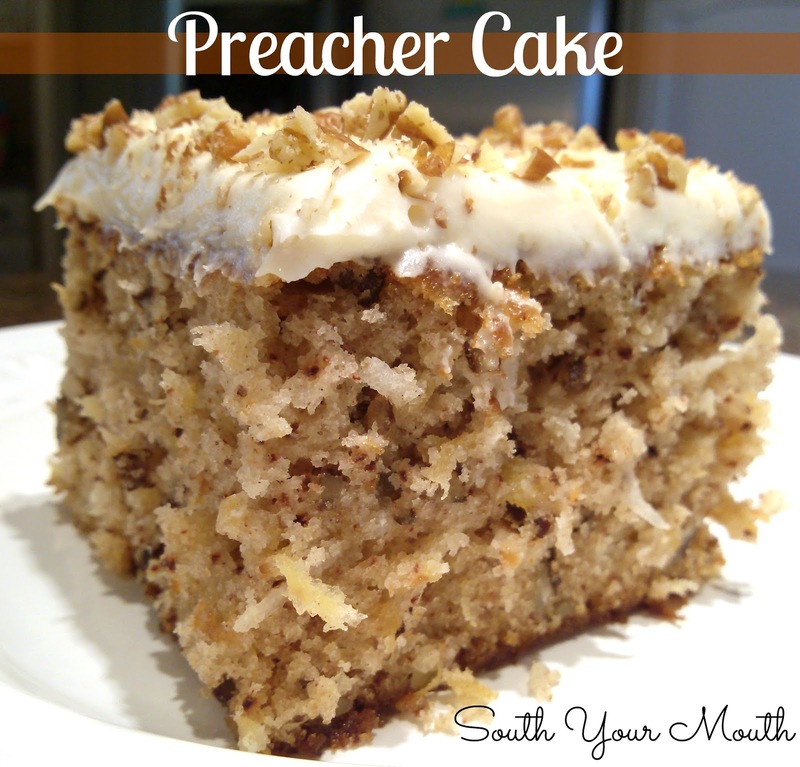 From what I've been told over the years, Preacher Cake got its name because it was a cake you usually had the ingredients for in your pantry so if the preacher told you he was coming to visit, you could whip one up with what you had on-hand. You can make it like I did in one big pan or you can make a 3-layered cake (this makes a ton of batter). If you make a layered cake, be sure to double the Cream Cheese Frosting so you’ll have enough. Also? I think this would be awesome made as muffins! If you like this cake be sure to check out this recipe for Moist Banana Cake too! If the preachers's coming you might need to grab a casserole recipe too! Here are some of my favorites! Add pineapple (undrained), 1 cup chopped pecans and coconut then continue mixing on medium-low speed until all ingredients are thoroughly combined (about 1 minute). Spray a 3-quart 13x9 baking pan with cooking spray. Pour cake batter into pan and bake at 350 degrees for 45-50 minutes or until cake is set in the center and a toothpick inserted comes out clean. Whip cream cheese, butter and vanilla with an electric mixer until fluffy (about 2 minutes). Beat in powdered sugar (add more if necessary to reach desired consistency – if your kitchen’s hot, you might need more because the butter will be softer). Oh my goodness...I have been looking for this recipe. The one I had and lost was called Hawaiian Wedding Cake, but I can tell by looking at this it is the same recipe. Thanks so much! Ooh it looks scrumptious! The preacher may not be coming over but I'm sure someone will and I'll be ready. Yum!! This is a cake my Grandma made for me for my birthday every year, so good and moist! We didn't call it Preacher's cake we called it "that good cake" she knew which one we meant! Grandma's gone now but I still make it once in a while, glad I saw it today. It's time for another one! Thanks for giving us all the good stuff to make!! Ha! Good one! Thanks for your comments!! I'm so glad you both enjoyed it!! Thanks for letting me know! anyone make this into cupcakes? No but I have some mini bundt pans and I'm going to see how that works. I can eat one and share one. I do because of the cream cheese frosting but if we're going to eat it the same day I make it, I just leave it out. This recipe looks very similar to the carrot cake I make for my husband's birthday every year, but without the carrots. I am gonna have to make one this weekend. As I was typing this comment I spied the recipe link for Hamburger Steaks w/ brown gravy on the side margin and looks like I found dinner, too! :) I think I've found recipe Heaven! I don't think it's super sweet... hope that helps! Oh no.....my fault......I mean how 'good' ~ 'neat' ~ 'deelish' ~ 'yummy'.....this cake looks. LOL! Got it! It's swweeeeeeeeeet! Mandy, I forgot to mention that I just found your blog and I like!! Took a peek around and you have some wonderful recipes.....you have a new follower!! Hi. I just found this page and omg. Ya' ll have truly touched a soft spot with me. My grandma and my mom always encouraged me to help our in the kitchen. 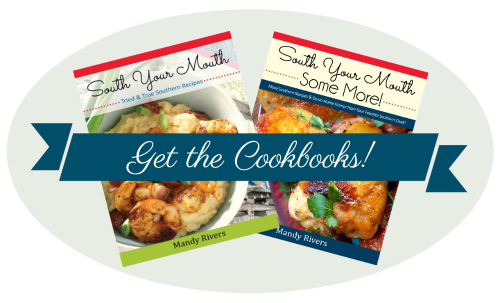 I love to cook and I dearly love to find new recipes to try on my family. I will also be taking this cake to our next family reunion! Thank you soooo much for sharing and you have another follower. Thank you! And I'm glad you found your way here! Bet they sell out at RMH bake sale! !!! Its in the oven now!! Just sorry I don't get to try it as its headed to church for a funeral dinner tomorrow. But you can bet it'll be among my Christmas desserts! It smells wonderful. magazine about 20? years ago or so but it uses alot of sugar and oil. i only make it once in awhile now, but its fantastic! I tried this for Christmas(2013), very good & will be making this again. The family loved it. Could you use self-rising flour and omit the baking soda and salt? Sounds like a realllly good cake!!! Hmmm... it won't be the exact equivalent but it should be close. If you decide to try it, let us know! Could you use desiccated coconut instead? Um, it could have another name, too. Pineapple? Coconut? = Pina Colada? Cake? It won't be the exact equivalent but it should be close. Maybe add 1/2 tsp baking soda and a pinch of salt just to be sure. I don't know that one but it sounds wonderful! I imagine the fat content of the cream has a lot to do with the results. Since she had the "real deal", it was probably pretty rich. You might want to add a little vegetable oil or butter and see if that does the trick. I just found this wonderful place so I am new here but I have this recipe. Maybe it is the one you want. Note: You could make this in a 13 x 9 inch pan and put whatever frosting or icing you want on it. Beat eggs until thick and lemon colored; gradually beat in sugar. Stir in sifted dry ingredients alternately with the cream and vanilla. Bake at 350° for 25 to 30 minutes, or until a wooden pick or cake tester inserted in center comes out clean. I might have to try this!! being a newly diagnosed diabetic, will a cup of splenda work just as well? Better known as "Hawaiian Wedding Cake". Doesn't matter what you call it, it's delicious! We call it humming bird cake it is delic.... we also add bananas. Preacher Cake has no bananas... Hummingbird cake does :) They're very similar. Can you make this is a bundt pan? Sure! There's probably enough batter to make two. I have had a very similar recipe for years. It comes from my great grandmother, and we called it a Granny Cake. I made this Sunday and it was a big hit with my friends and family. Thanks! I don't like pineapple can you use something else maybe peaches? 'google it!!!' You can type in anything and get hundreds of places to go. She was looking for *her* recipe. Whyy? Because her recipes are GREAT and the internet is full of crap. My mom would make this cake for very special occasions, and she called it Hawaiian Wedding Cake. I never made it because it sounded very complicated to me when I was a 'rookie' baker, but I now see that it's very easy to put together. Most of us already have the 'main' ingredients on hand, and can pick-up the rest during our next shopping trip. Thanks for reminding me about this scrumptious cake! I love your blog, and I'll definately follow you. I just made this cake but I didn't put the nuts or coconut in it and it turned out great! I made one for the first time last weekend and my husband ate it without the icing. He really enjoyed it. But I want to know do I pre-heat the oven first or put the cake in a cold oven? So glad your husband enjoyed it! Yes, to bake at 350 degrees you would need to heat your oven. MY WIFE MADE THIS FOR MY BURTHDAY FOR40 YEARS. SHE IS GON NOW SO I WILNOT BE GETTING IT FROM NOW ON IF I DON'T MAKE IT. Thank you Claudine Bratcher, Fort Worth Texas. Your Cream Cake is just what I needed for a wonderful man's 100th birthday this year who only likes vanilla cake and frosting. I will use my mother's coffee frosting that I loved as a child. Can you share the coffee frosting recipe? I made this cake following the directions exactly but it had an after taste that was salty. If I made it again I would leave the salt out I guess. I don't know what happened. I thought it was going to be so good. We were disappointed. Well... I'm happy to report I figured out the problem. I discovered some of the sugar I used was actually salt! No wonder it came out tasting salty. So I will definitely be making this cake again, obviously being more careful this time. Duh. I am enjoying your recipes so much! Thank you for sharing and posting so many great things...and your commentary! I made this tonight and it was delicious !!!! I have made this 3 times now, first time making in a 9 by 13 inch pan, but last time and this time I made in 2 square pans and freeze one for later use!! We love it!!! I don't own a nut grinder. I put the nuts in a sealable bag and hit them with my rolling pin. It's free and works great. This cake is not very similar to the Hawaiian Wedding Cake recipe I've used in the past. A friend passed this recipe to me years ago under the heading of "Chop Suey" cake. We couldn't figure out why it was called this but who cares, it is simply delicious. As rose by any other name is still a rose. will be taking this to my preachers surprise birthday celebration next weekend. Thanks for the idea....recipe. Since I'm the preacher''s wife, I knew I had to try this recipe. It was awesome! Everyone at church loved it! Thanks so much! 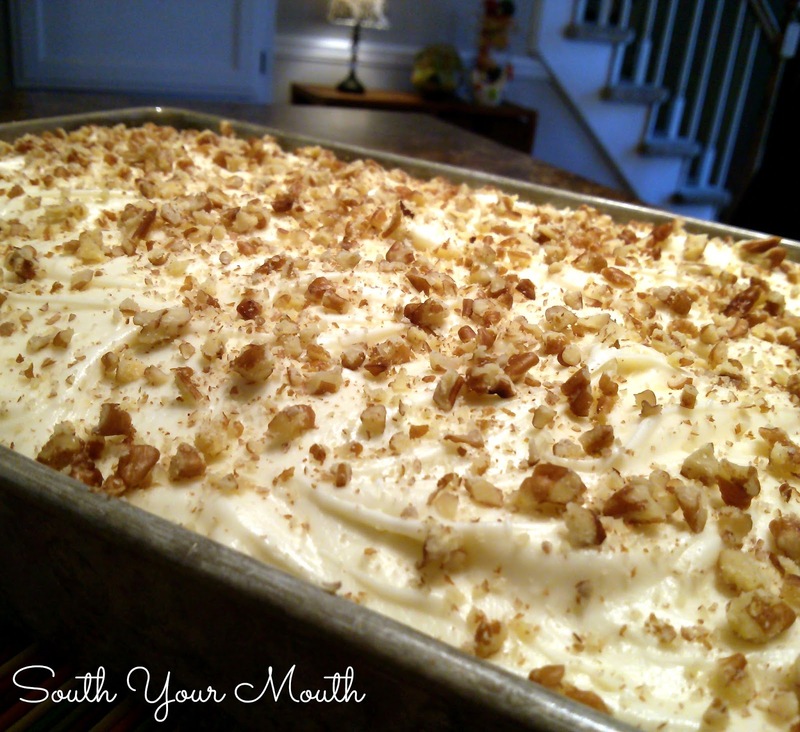 This recipe is almost the same for my carrot cake---increase the cinnamon to 2 tsp. and add 3 cups grated carrots. All the rest of the ingredients are the same. Your version looks really yummy, though! I bake, i cook, i cook gourmet, and I make candy.. isn't that awesome?! I really enjoy your recipes from bisquick. I would like all the recepies you've ever had for it. I love this cake & love to make it. The cake is easy to make because I am not much of a cake baker. But this cake I can bake with out much trouble. Thanks for sharing with us. You only need 1-1/2 recipes of the frosting for a layer cake, not 2. Disappointed that by the time the inside was fully baked, the outside became very brown and over-baked. Maybe bake at 325 instead? If I I use 3 8 inch round cake pans how long should I bake the cake? Thanks so much. id like to make this for my Quaker meeting-but i dont use sugar-can i substitute honey or maple syrup? and if i do should i increase the dry ingredients? I too would like to know the temp and how long to bake in (3) 8 inch pans.....?? I made this cake last week for a recovery group meeting. Only crumbs were left in the pan. The cake was delicious and so easy to make. Thank you for sharing the recipe!! This cake sounds great. Does anyone remember the name of the traditional southern cake that was made in a 13 x 9 pan and it had nuts in it? When it baked it was all crackly and unattractive looking but you scooped it out like a cobbler? To: Pattysays - Could you be thinking a Mississipi Mud Cake? The icing cracks and the cake is very moist. One of my all time favorites. Mandy, this is one of my all time favorite cake recipes. I have made it many times since finding it on your blog. I shared it last week with a friend who wanted a great cake to make for Thanksgiving. I added banana and golden raisins to the recipe, orange zest to the icing! Respectfully, that is an awful lot of oil for a 9x13 cake. Has anyone substituted 1/2 applesauce? I realize the result and texture will not be the same but I'm not sure I could add an entire cup of oil to a cake batter. Thank you - Karen M.
Is there a way to join your recipe page? Hey just came across your recipe for Preachers Cake and noticed it was a little different from mine. My Grandmother made this cake and it is the only cake my husband requests for his birthday every year.This is an old recipe and I thought you might like to have a copy! In bowl stir together the dry ingrediants, in another bowl mix together the wet ingrediants. Add the wet to the dry and mix well. Pour into greased and floured 9 X 13 pan and bake in 350 degree oven for 30-40 minutes. This cake doesn’t raise too much so don’t be alarmed! This is a heavy rich cake. Mix butter and cream cheese till combined. Add remaining ingrediants and blend well. can you forgo the coconut, someone in my house has an allergy to it. What would be the equivalent measurement for Pecan extract. My husband would love this but can't eat any nuts because he doesn't have teeth (and won't wear his dentures). Maybe grind up the pecans to smithereens and add? I finally made the preacher cake for the family gathering yesterday and everyone enjoyed it. I toasted some coconut and sprinkled it on top. The cake was in the oven for 4 minutes when I realized I forgot to add the vanilla. Pulled it out, drizzled the vanilla over the top and gently swirled it through the cake with a spatula! Another name for this cake is chopped suey cake which I used to make years ago. Thanks. OMG ! This was easy, delicious and tall. I was a bit apprehensive because I thought it was a bit soupy when I put it in the dish. Baked tall and light and sooo good. Thank you so much for sharing ! Could I substitute the vegetable oil with rice bran oil please? I am not familiar with rice bran oil so I'm not sure. Is your recipe calling for sweetened canned pineapple or unsweetened? Looks good! Thanks! Love this cake!! This is the one my family asks for ever time ........ Love it and it’s so easy to make thanks for sharing!! Made it for a church social and everyone loved it. Please tell me if it is bicarbonate of soda or baking powder that is used.